Technical Car Experts Answers everything you need: How to remove the instrument cluster on 2002 toyota solara? How to remove the instrument cluster on 2002 toyota solara? Make sure the front wheels are facing straight ahead. Remove the clip and seven claws holding down the meter hood assembly. 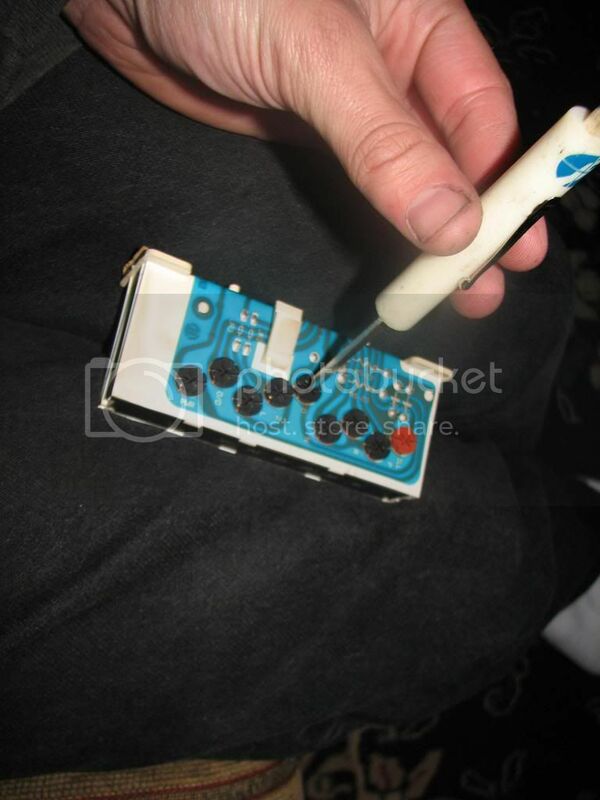 Using a molding remover, disengage the 4 claws, then remove the instrument panel register assembly. 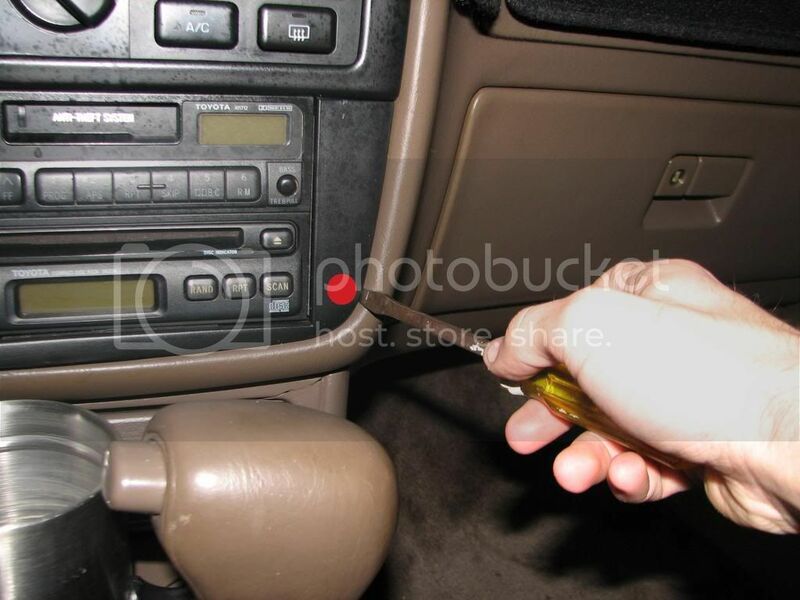 For a manual transmission, remove the shift level knob by unscrewing counterclockwise. Using a screwdriver, disengage the 6 claws on the upper console panel. Remove the heater control knob. Remove the screws and the instrument cluster and finish panel. Replace the upper console panel. 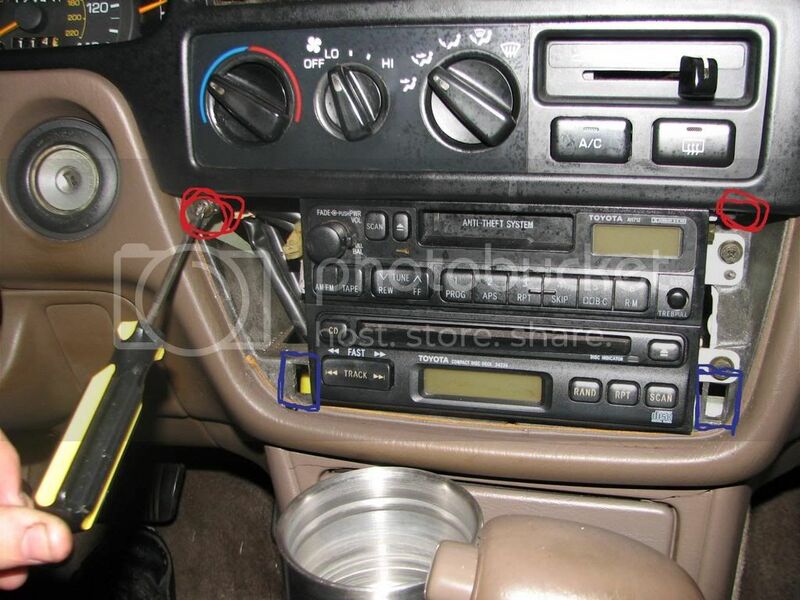 Replace the heater control knob. Replace the instrument panel register. Replace the meter hood assembly. Replace the steering pad and wheel. Reconnect the battery and check for proper function. Using a screwdriver, disengage the 2 clips and 3 claws, and remove the armrest. Using a screwdriver, disengage the clip and 5 claws, and remove the armrest upper panel with the power window regulator master switch. Remove the 3 screws and switch. Remove the front armrest base panel upper. Using a screwdriver, disengage the 7 claws, and remove the armrest panel together with the door lock switch. Disconnect the door lock switch connector. Using a screwdriver, disengage the 2 claws, and remove the door switch. Maintain the position and turn the handle as shown in the illustration to remove the handle. Using a screwdriver, disengage the clip and claw, and remove the garnish. Remove the 3 screws on the door trim board subassembly. Using a screwdriver, disengage the 8 clips and remove the trim board upward. Using a screwdriver, disengage the door inside handle assembly. Move the inside handle in the direction indicated by the arrow mark in the illustration. This will release the claw and allow removal of the inside handle. Disconnect the 2 cables from the inside handle. Disconnect each connector, and remove the front door service hole cover. Disconnect the outer mirror connector. Remove the 3 nuts and outer mirror. Remove the front door belt molding. Using a drill of less than 4 mm (0.16 in. ), drill out the 3 rivet heads and remove the speaker. Remove the 3 screws and plate for the inside door panel plate. Insert a cushion inside the door panel to prevent the glass from being scratched and remove the glass sub-assembly. Move the door glass until the 2 bolts appear in the service holes and remove the 2 bolts. Disconnect the window regulator connector. Remove the 6 bolts and window regulator. Place matchmarks on the window regulator motor bracket and regulator gear. 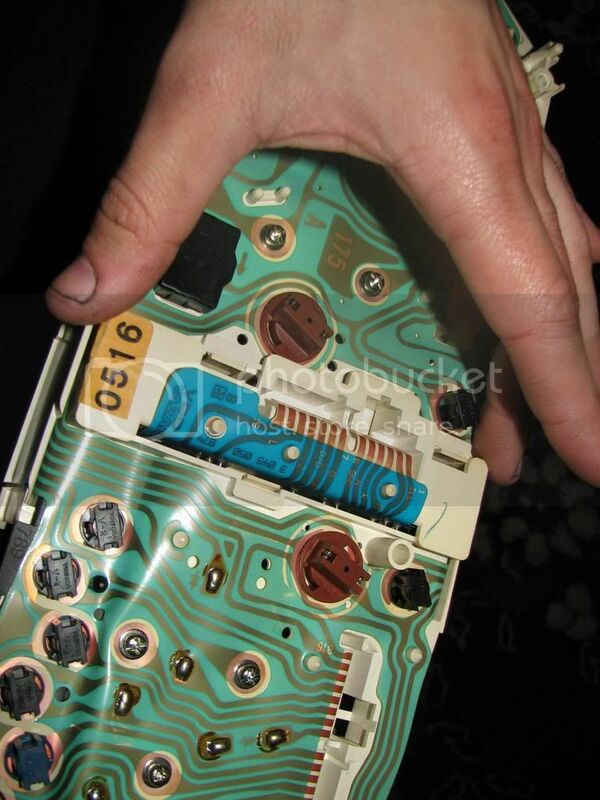 Using a "torx" driver (T25), remove the 3 screws and motor. Also click this link for video. Position the front wheels straight ahead. Place matchmarks on the intermediate shaft and the control valve shaft. Left and right front fender apron seals. Cotter pin and nut holding the steering knuckle to the tie rod end. Tie rod end from the steering knuckle. Lower bolt holding the control valve shaft to the intermediate shaft. Intermediate shaft from steering rack housing. Return line and the pressure line from the control valve housing. Stabilizer bar bolts and nuts. Do not remove the bar from the vehicle. If necessary, rear engine mounting and bracket for additional clearance. On the V6 engine, oxygen sensor. On the V6, oxygen sensor. Rear engine mounting bracket. Bolts: 38 ft. lbs. (52 Nm). Stabilizer bar bolts and nuts. Tube clamp. Nut: 84 inch lbs. (10 Nm). Intermediate shaft to the steering rack. Bolts: 26 ft. lbs. (35 Nm). Tie rods to the steering knuckles with the castellated nuts. Disconnect the pressure tube from the power steering pump. Replace the retaining bolts an torque them to 26 ft.-lbs. (35 Nm). Adjust the drive belt tension. Connect the pressure tube to the power steering pump. Using a "torx" socket wrench, loosen the 2 "torx" screws until the groove along the screw circumference catches on the screw case. Pull out the steering pad from the steering wheel. 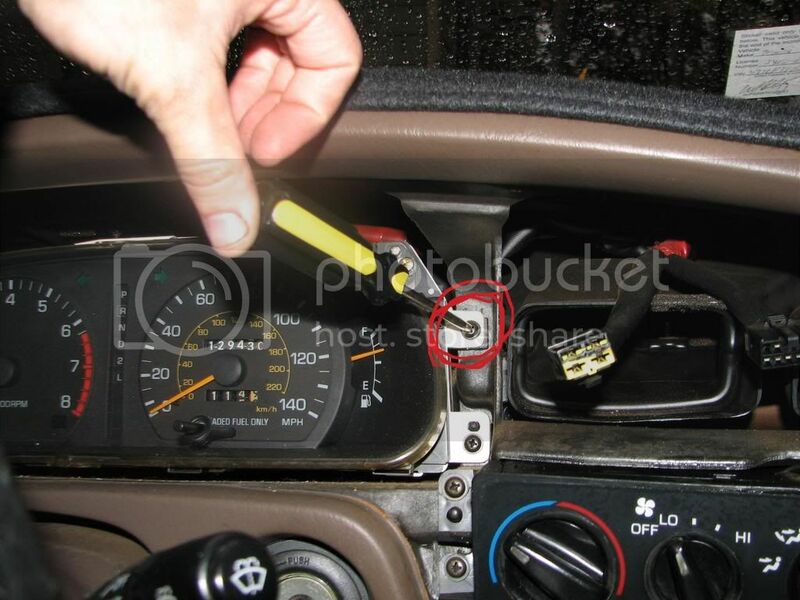 Using a screwdriver, release the lock part of each airbag connector and disconnect the 2 airbag connectors. 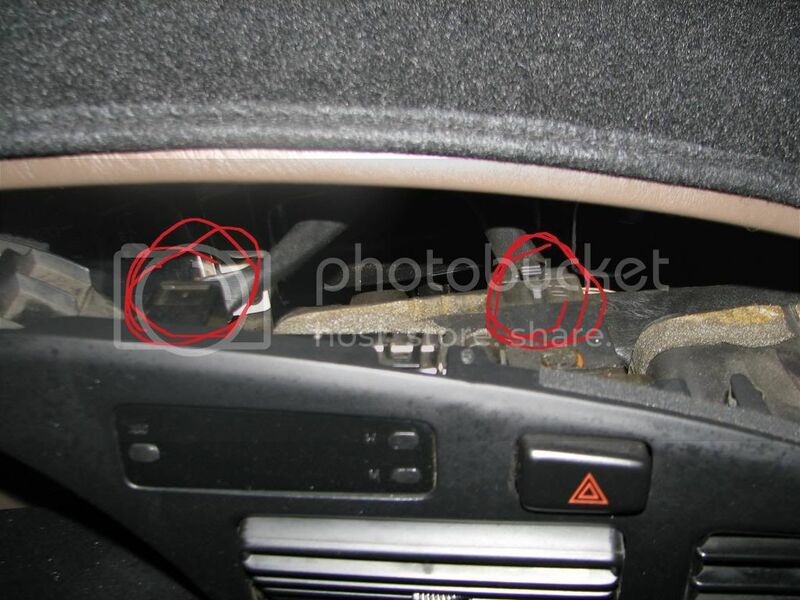 If the airbag connector is disconnected with the ignition switch being at ON, DTCs will be recorded. 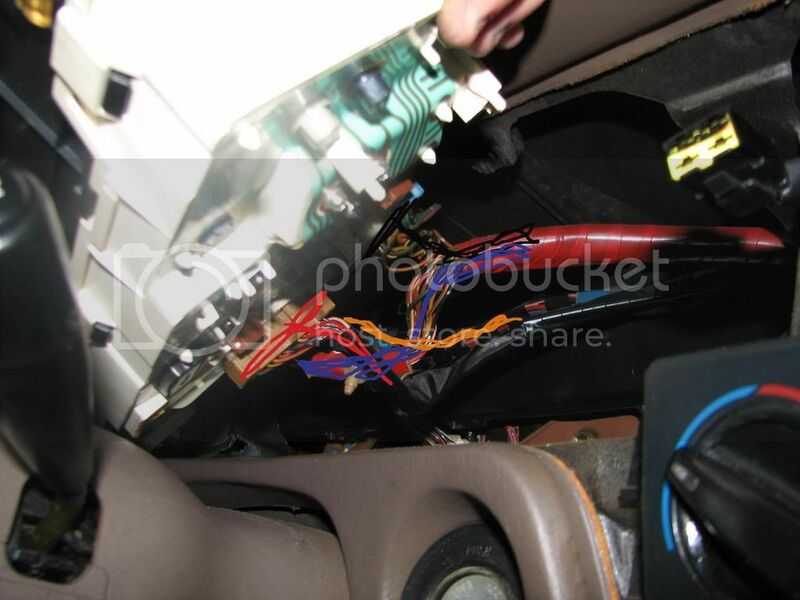 When removing the steering pad, take care not to pull the airbag wire harness. When storing the steering pad, keep the upper surface of the pad facing upward. Never disassemble the steering pad. Remove the steering wheel assembly set nut. Place matchmarks on the steering wheel assembly and main shaft assembly. Remove the steering wheel assembly. Your very own two hands. Find the two screws above the gauges and unscrew them. Pull the gauge trim off by pulling firmly straight out. Unplug the 3 connectors behind the gauges. Remember the order and placement of each connector so you dont screw up!! Now, if you pull out the gauges, and look on the back, youll see a thin circuit board with a bunch of connectors on it. These connectors just twist off and pull out to expose the bulbs used inside. Now this is the hard part. Just take out the connector, and pull out the old bulb. NOTE* on the pictures the bulb is clear, but normally there is a green coating on them to make them look green. I took these off and they made my gauges look orange. Now take your new bulbs and fit them into the sockets. I chose red. Place the bulbs back into the hole, twist and repeat on all the other connectors. Now put everything back together and flip on your lights, and enjoy the new color of your gauges! 1: Remove the Radio U Trim. There are 2 clips, one seen in the picture below in red. Use a flat head screwdriver to pry it off. The picture for 2: shows better where the clips are (In Blue). Then unplug the bulb on the Cig Lighter, and then pull off the plastic L plug on the Cig Lighter. 2: Unscrew the 2 screws seen in the picture below (in Red). 3: Unscrew the 2 screws (In Red). 4: There are several clips then holding the rest of it on. Pull it off, BUT be gentle yet firm. 5: Unplug all the accessories (Clock and Hazard switch seen in picture). Also need to unplug the Dimmer and Mirror switch to the left of the steering wheel. Then remove the trim piece. 6: Unscrew the 4 screws holding on the Instrument Cluster. 7: Unplug the 4 harnesses on the cluster. 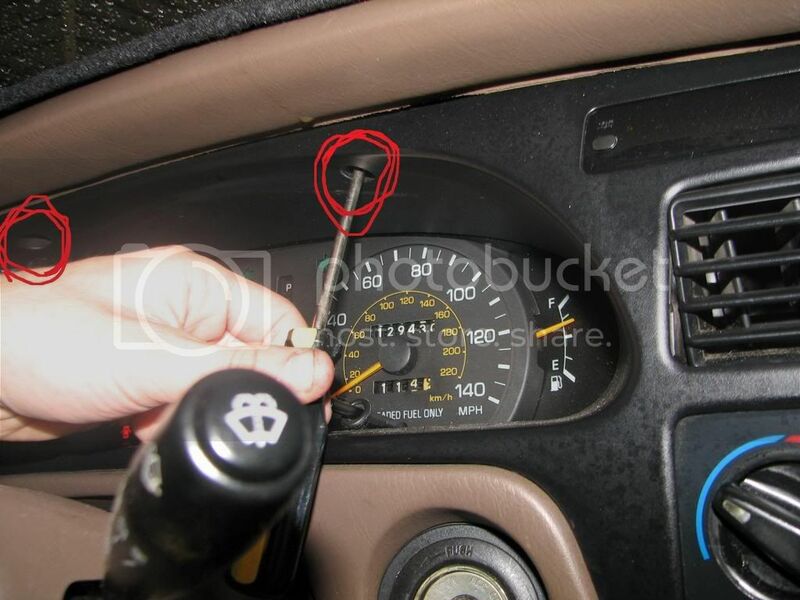 8: Take out the gear indicator light section as seen below. It’s a little bit of a pain to do. I advise using a small flathead screwdriver. There are 3 clips. It’s best to have the screwdriver ready, pop it up on one side from 1 of the clips, and use the screwdriver to GENTLY hold it up, while undoing the other 2 clips on the gear indicator which should then just pop up from the slight pressure. It’s a bit hard to explain, but you should understand it perfectly when you are actually doing it. 9: Unscrew the bulb marked as “D”, and replace it. Labels: How to remove the instrument cluster on 2002 toyota solara.